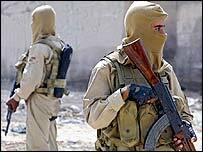 Insurgents have infiltrated Iraq's security services, National Security Adviser Muwafaq al-Rubaie has admitted. Speaking on the BBC's Newsnight programme, he said he had no idea how far the services had been undermined, with problems "in many parts of Iraq". It comes after the British Army said it was forced to take action to free two UK soldiers after learning Iraqi police had handed them to a militia group. UK defence chief John Reid will meet Iraq's prime minister on Wednesday. Mr Reid and Ibrahim Jaafari are expected to discuss the growing tension in the southern city of Basra between the British Army and local authorities. The Pentagon warned in July that Iraq's police force was recruiting insurgents. The Iraqi interior minister has disputed the UK's account of the circumstances surrounding the release of the two British soldiers in Basra. Baqir Solagh Jebr told the BBC the men never left police custody. He said the UK forces that freed them had reacted to a "rumour" that they were in militia hands. Separately, an Iraqi journalist with national newspaper As Safeer has been shot dead in Mosul. The death of the paper's Mosul bureau chief, Firas Maadidi, comes two days after the killing of his female colleague, reporter Hind Ismaeel. On Monday, Iraqi journalist Fakher Haidar al-Tamimi was shot dead in the southern city of Basra. Mr Tamimi worked for several foreign news agencies, including US daily The New York Times. The Iraqi government has launched an inquiry into events surrounding the arrest of the British soldiers on Monday, both thought to be members of the SAS elite special forces. Iraq's interior ministry ordered the police force in Basra to release the soldiers - but that order was ignored. The British Army said the troops had been handed over by police to a Shia militia group. The men were freed after British troops in armoured vehicles stormed a Basra prison and then a house to which the captives had been taken. Mr Rubaie told Newsnight: "Our Iraqi security forces in general, and these in particular and in many parts of Iraq, I have to admit that they have been penetrated by some of the insurgents, some of the terrorists as well, so I can't deny this." He said Iraq now had "a very scrupulous, very meticulous vetting procedure" to "clean our security forces, as well as stop any penetration in future from the insurgents or the terrorists". 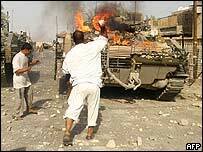 He admitted he did not know to what extent the security forces were already infiltrated by insurgents. However, Mr Rubaie criticised the British military's use of force instead of negotiation in freeing its troops on Monday. "They could have been freed in a much more peaceful, much more friendly and amicable way than that," he said. Colonel Bill Dunham, the chief of staff for the multinational force in Basra, told BBC radio the infiltration of insurgents into Iraq's security forces was a problem across Iraq. A report released by the US defence department in July blamed the problem on poor vetting procedures and recommended that the quality of records at Iraq's interior ministry be checked.